Q - "The 'Unofficial' Champ"
Q is believed by many to be the greatest WCWF wrestler ever. He is the self proclaimed icon of the WCWF and has a very healthy ego, to say the least. Q's favorite moves include the Somoan Drop, DDT, reverse DDT, powerbomb, figure-4 leg-lock, and the tombstone-style piledriver. His finisher is The Infinite End (a Kamikazee). Q has held the WCWF World Tag Team Championship (with Chris Genocide) and the WCWF World Heavyweight Championship. 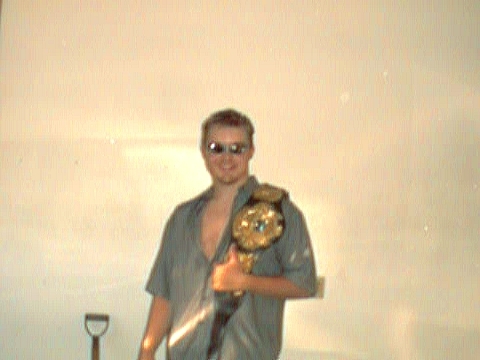 Because his loss of the heavyweight title to Smallpac (at Summer Slaughter '99) was rather controversial, Q claims to be the WCWF's "Unofficial" Champion. "Smallpac may have the belt," Q says, "but I have the title!" Q's worst enemies are Smallpac, G.Y.M, and Z Shark. His closest ally is Chris Genocide. Q's idols and influences include The Rock, "Stone Cold" Steve Austin, Ric Flair, Rob Van Dam and Shawn Micheals.